We have a full catering menu and are able to deliver to events if applicable. 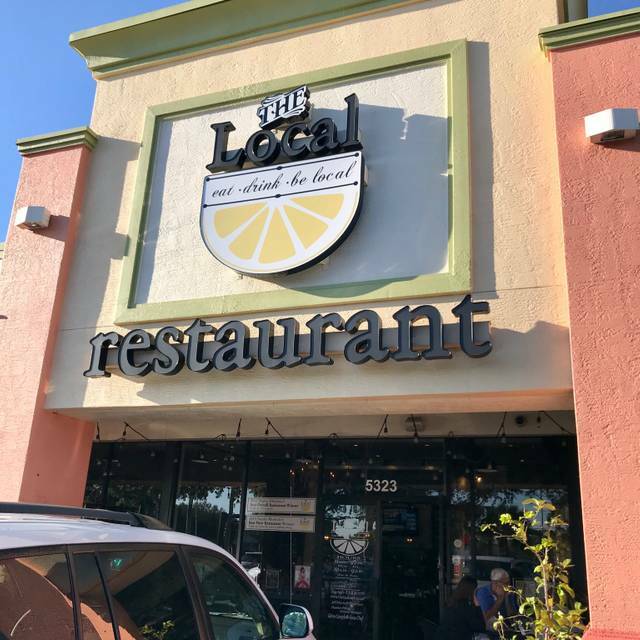 The Local, Naples, Fl, is Naples' first farm-to-table, sea-to-table restaurant specializing in locally sourced ingredients. 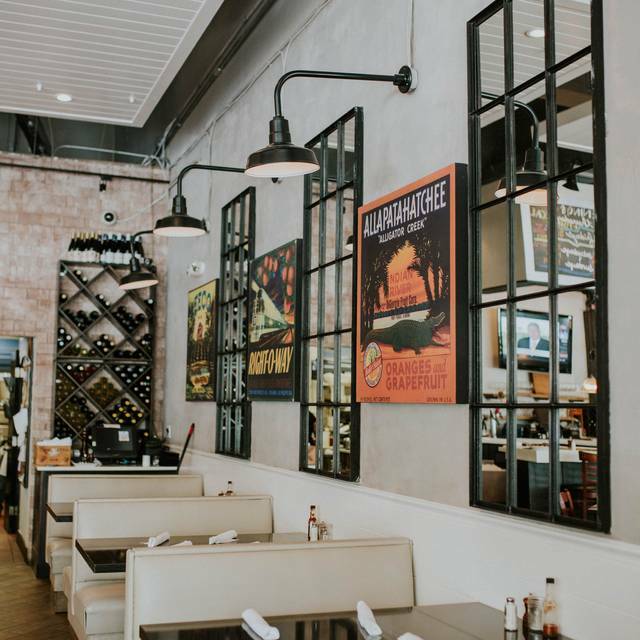 The restaurant was founded by Owner-Chef Jeff Mitchell, a classically trained chef and wine expert with 20 years of experience in the culinary and hospitality industry. He is also an alum of the Culinary Institute of America. Florida’s abundant seafood and long growing season inspires a menu that changes daily according to the day’s delivery. Grass fed beefs, meats from sustainable farmers, local seafood and the freshest local produce in Naples and Southwest Florida appeal to carnivores and pescatores as well as to healthy diners including vegans and vegetarians. A complete collection of superb, value wines makes the wine list one of Naples' best. The ambiance is casual, convivial and rustic, with blackboard specials and a cozy wine bar. We just ate at The Local one night last week and it was fantastic - we decided right after dinner this would be the best place to have Easter Brunch. I'm not sure what happened, but it took 55 minutes to get our breakfast...the food itself was great, but I was not expecting to wait that long especially with my 2 boys. They also told us right away that the Frittata which was the special of the day, was not being served so my guess is they were very short handed in the kitchen. I would go back because the food is excellent, and everyone has a bad morning once in a while. We are regular diners at The Local. Tonight we brought in friends. Sadly, the table directly next to us had children that were horribly unruly! Everyone in the restaurant was bothered by them. The noise level was SO loud we could not carry on conversation with our friends. It ruined the evening. As well as others. We brought this to our server’s attention (who also serviced their table) and he made light of it. Someone from management should have asked them to either quiet their children or move to an outside table. Not cool. And a huge disappointment to many. I already have recommended The Local to a friend who is always looking for gluten free options on restaurant menus. He's very excited to check it out. It was not like other farm to table experiences I've had. The food was decent, but not terrific. Our server was wonderful. Might give it another chance at some point. Great food and service. It does not server hard liquor, just beer and wine. Seated immediately in a not very busy restaurant - odd I thought - in Season in Naples? Ok, whatever...prompt beverage service...went downhill from there. Placed our food orders and waited, waited, waited...finally the food arrives and what a disappointment. I'd ordered the kung pao avocado with brown rice - small portions and so much salt it was nearly inedible...ugh...my friend ordered the cobia - very small and tasteless - our bill was over $70...ugh ... we'd have done better at a local diner than at The Local...they're doing a disservice to the farmers and fishermen they represent. I wonder if the chef had the night off? I predict they won't be open long...sad to say. Overall, the experience was positive and I would recommend this restaurant. The meals were terrific -- and we had four different entrees. Service was fine, though we sat for what seemed to be quite a while before being approached by a server. We chose to eat outside -- if overlooks a parking lot and is next to another busy restaurant. Inside may be been the better option. No wine by the bottle, so the prices seemed a bit high. Great first time experience and the food was excellent. The food was very different but excellently prepared. Service was very good as well. It has taken me awhile to write this review. Sorry to say we did not have a good experience. It took 20 minutes to get a glass of wine. The restaurant was sorely under staffed. Our waitress was running back and forth outside and across the room. Our hostess, the water server and our waitress told us, “be there in a minute”. It didn’t help that I had two guests. Same with food. Long wait. And then no service. Never checked on us. Never offered another glass of wine. Never asked about dessert. Was so disappointed because I really LIKE this restaurant, what they produce and what they stand for. The food was good. Very good. With so many choices, it may be hard to go back. The Local is wonderful! Great atmosphere, craft brews and innovative cocktails, fantastic sea- and farm-to-table food. Prices ranged from very reasonable for pizzas and burgers to a little more upscale for entrees, but definitely worth every penny. The restaurant had a neighborly ambiance. The waiter was friendly and most pleasant. We found the menu interesting and tempting with appealing selections. My dinner beet salad was tasty and a little too big with the amount of arugula. My friend chose a veggie burger which she described as the best she had ever had. Prices were considered reasonable. We would definitely visit The Local again. Food was good - tacos were way too small for the price and it was a half an hour wait for the salads. Probably won’t go back. Thank you for taking the time out to write the review. We are always striving to be better everyday in every aspect. The issue with the portion size and the timelines has been address with the Exec. Chef. We greatly value everyones inout. I do hope that you give THe Local another chance in the future. The only good dinner was snapper. Pot roast bland, pork chop ok but the smoked brisket was soo dry and over cooked nice wine and dessert. Oh the spinach dip was fabulous. Excellent food and service. Just a tad loud- but it was a Friday night. Wonderful flavors in everything they do. And an amazing variety from salads to full course fancy meals. I wasn't overly impressed with the menu but the food we ordered was very flavorful. Service was very good. I thought the prices were a little high but for Naples that's what we expect. Very disappointed. Food was bland - we ordered the fish special of the day and it had no flavor. The sauce added nothing. The portions were small - fine if the food was tasty and interesting - and expensive. $33 is not a lot to pay for a good meal but for a flavorless bad meal it is. We will not be back. Fantastic to find such a gem in the Naples area! Probably the best meal I've had in the area. Steak to perfection, great menu, KETO friendly! 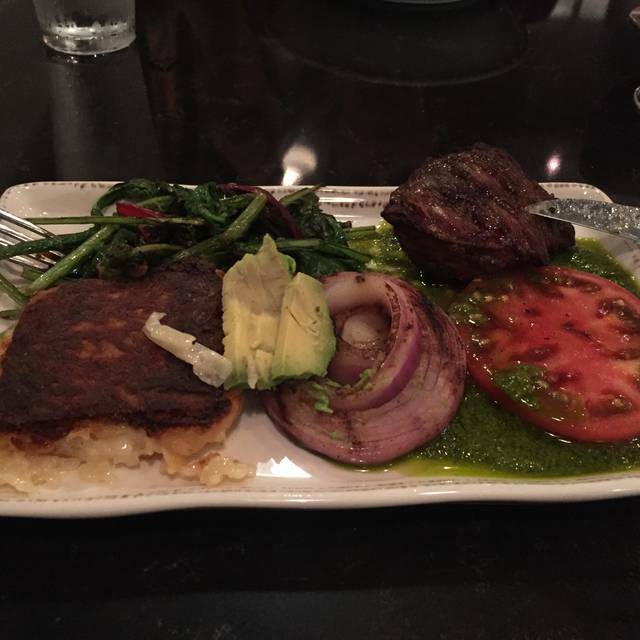 This place had phenomenal food that satisfies the palate with a cheerful and fun atmosphere. Definitely going there again! Great for those with gluten free needs! This was not “eating out”; this was a culinary experience. Excellent food and service. Disappointed in experience. They ran out of fish special and substituted a different fish but charged the same. Also ran out of requested side of roasted vegetables. Long wait for food but they did give us a caprese salad to share as a compensation. Waitress did an excellent job. I wouldn't recommend this restaurant to a friend because, despite the nice surroundings and decent service, the food is sub-par. My vegan friend ordered the burger that was only "meh." There are good pre-made burgers on the market - Beyond Beef, Impossible Burger - which puts pressure on restaurants who make their own version to measure up. This burger didn't. I ordered the vegan zucchini pasta which was overly sweet and the sauce watery. Pizza has "vegan" options, but basically they just take off the cheese. Again, many good vegan cheeses on the market to choose from. A note to the restaurant - if you're going to offer vegan food, invest in knowing how a vegan might eat. The food was very good - fresh and well prepared. Our waiter was a bit forgetful, but had a lot of tables. We visited The Local and were quite impressed. Our waiter was juggling several tables. We minded the delay a bit but we could see how busy he was. Our meals were delightful. We will be back! Tried this on a whim as we were shopping near by. Very impressed with the great variety on the menu. Creative dishes. Server was friendly and helpful. We will definitely be going back. We enjoy The Local on a somewhat regular basis. Food is always fresh, staff is courteous. We would love to see the menu change out with the seasons! Thank you so much for you continuous support. We love to make a one time guest into a regular and it thrills us that you have become one. Thank you again! I was excited to have a place that had local options - as well as the gluten free. However, I was surprised to see the prices didn't go with the option. Pot roast was surprisingly expensive- as an example. Good menu of fresh farm to table food. The food quality was very good as was the service. The ambience and value were just ok.
One of my most favorite places in Naples, the place is casual, parking is easy, the food is great and creative, all locally sourced, the menu changes regularly, the apple pie is amazing, the fish always very fresh and well prepared, it's always a wonderful place to eat. Good, fresh food. It took much longer to get our food than last time I was there and it was not packed. Sides and salad were great. Cobia was the special fish- it was tasty but slightly over cooked. Would definitely go again and would recommend due to the healthy, local fare! I don't usually write less-than great reviews but, this restaurant is different. First, our waiter took 10 minutes to take a drink order. We asked about beer choices, he didn't know what they were and suggested we get up from our table, go to the bar and read the beer list hanging on the wall????? Then we ordered drinks, six to be precise, two beers, three glasses of wine and a cup of coffee. Another ten minutes or so later, he proceeded to deliver only one glass of wine. Several minutes later two drinks (beers) came out and maybe another ten minutes later he came and apologized for forgetting the one order of coffee completely and that the other two glasses of wine would just be another minute or so. All the while we watched him flitting around the dining room chatting up other customers and the lost drinks finally came after several more minutes. I spoke to him (politely) about his inattentive manner and he apologized and sped up up a bit. The other disappointment was the Menu. Only one pizza was identifiable, the others were the oddest Pizza combos we've ever seen. The Menu had some pasta dishes but the rest of it was heavily VEGAN (veg Burger with no beef burger counterpart) and several, what appeared to be, very over priced main dishes that for the most part were unrecognizable. Overall it was a disappointment, just not very interesting and they advertise that the Locals eat here? They do?